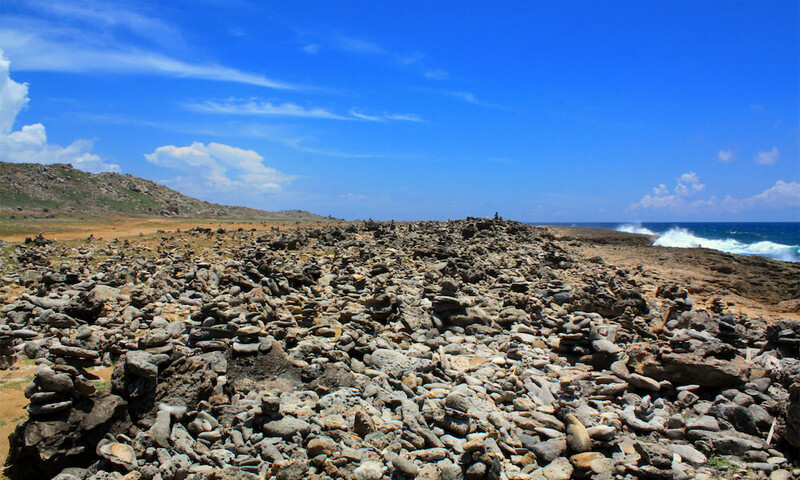 Often referred to as the Rock Wish Garden in Aruba, mainly on the north-eastern coast you will find little stacks of rocks that look like they were formed by nature but in fact are not. The piles of rocks are man-made! Rock Wish Garden is a tradition for tourists made by tourists. When you are passing the Rock Wish Garden by a guided tour or when you are visiting the surroundings on your own and you would like to make a wish, here’s a brief description how to make your own pile of stones. First, start by collecting some suitable rocks for stacking. That might sound easy but there are so many rocks to choose from so it is a bit of a challenge finding the right ones. The persistent wind from the north east certainly is not helping you! When you have collected some suitable stones you are ready to start stacking. When you have chosen the location to put your stack, begin by flattening the surface. Then one by one start building your “tower of devotion” and do not forget to make a wish at every stone you put in your stack. There’s a wish connected to every stone you stack. Should you use 10 stones or 20 or 30 and make that many wishes? Actually, that all depends on what you want. Bear in mind that your creation cannot collapse, it has to stay in one shape as from the moment you started stacking and wishing. There comes a point where you have to stop stacking the stones. The wind will notice there’s an object getting unstable the more stones you are trying to put. Some people like to decorate their stack with objects that they either bring or that they find on the beach. We have seen people decorating with wood, shells, seaweed and all kind of other stuff the ocean brings to the beach. Visiting the Rock Wish Garden and creating your own stack of rocks is a fun activity to do. Certainly when you are at a place where you can see so many. Every stack has its story, every stack has been formed with a certain mindset. Going to Rock Wish Garden maybe is a kind of a spiritual journey during your stay in Aruba. Away from the busy places and choosing a moment of your own! To keep Aruba beaches as clean as possible, it is important to realize that you do not litter when visiting Rock Wish Garden. Try to preserve the beach as much as possible. Every year a National Coastal Clean Up Day is being held in October/November to undo the beaches of as much waste as possible. Do not hesitate to contribute when you are around in this period of the year!